On 18 June, the UN Human Rights Council begins its 38th Session (HRC38) in Geneva. Over the next three weeks the UN’s top human rights body will act on some of the world’s most pressing human rights violations and abuses. The agenda is especially packed this June: it will include discussions on numerous reports of the OHCHR and special procedures, many related to digital rights and freedom of expression, with many important HRC resolutions being negotiated in parallel. These resolutions will be adopted in the concluding days of the Session on 5 and 6 July, and we’ll be pushing to ensure they contain strong commitments to protect freedom of expression at the national level. This will be a challenge. The HRC’s membership includes States that are among the worst offenders when it comes to violations of the right to freedom of expression. At a time when multilateral diplomacy for human rights is under increasing strain, ensuring that all States that believe in freedom of expression remain invested in the HRC as a venue to protect this right is essential. ARTICLE 19 will be present throughout the Session to advocate for progressive free expression standards, and for action on serious violations of this right, to hold States to account where they are failing to live up to their obligations and commitments. Addressing violence against women facilitated by ICTs. It is essential that the HRC delivers on its mandate to bring about meaningful change to human rights situations at the national level. Where States are failing in their obligations to protect freedom of expression, the HRC can be an essential forum to call them out, as well as for establishing mechanisms that can assist in the pursuit of accountability. Despite being one of the most dangerous countries in the world to be a journalist, political will and resources to prevent, protect against and prosecute attacks has ebbed in recent years, as the situation in Mexico has deteriorated. We will be highlighting the Special Rapporteur on freedom of expression’s recent report following his country visit to Mexico, and convening an event to discuss its findings and recommendations. Under Item 4 (country situations of concern), we will be raising serious concerns with the Russian government’s attempts to block the Internet messaging service Telegram, which has resulted in extensive violations of the right to freedom of expression and access to information, including massive collateral website blocking. Together with measures to blacklist websites, and draconian measures to counter so-called “extremism”, the situation for freedom of expression online makes clear that Russia is entirely disregarding its human rights obligations, and the commitments it has made at the HRC. In a joint event with the Committee to Protect Journalists and Reporters Without Borders, featuring the UN Special Rapporteur on freedom of opinion and expression, we’ll be shining a spotlight on the various ways in which press freedom is under threat in the USA, and the global ramifications of President Trump’s attempts to undermine the role of the media as a public watchdog. During the Session, we will also be responding to the Special Rapporteur on Eritrea’s annual report, joining calls for the renewal of the mandate, providing updates to the situation for freedom of expression in Myanmar, and commenting on the adoption of the UPR for Burundi. A number of UN special procedures will present annual reports relevant to freedom of expression at HRC38, including the Special Rapporteurs on freedom of expression, on freedom of assembly and association, and on violence against women. The OHCHR will also present a report on civil society space in intergovernmental organisations. On these issues, corresponding thematic resolutions will also be negotiated and adopted, demonstrating the international community’s priorities for legal and policy action, while reflecting (and often shaping) how States understand their international obligations. While such resolutions can sometimes appear abstract, they can provide strong frameworks for action, which we can leverage at the national level to advance protections for freedom of expression. The Special Rapporteur on freedom of expression will present his annual report to the HRC on 19 June. The report focuses on how user-generated content is moderated online, outlining the role and responsibilities of companies in shaping our global information landscape, and expressing concern at how States increasingly seek to pressure companies to engage in censorship. The report recommends that States avoid coercive models of intermediary liability, and drive for greater transparency and remediation in the conduct of private companies. This requires, importantly, greater transparency on the part of States on the requests they are sending to companies. “Smart regulation” requires States to repeal draconian content-based restrictions that do not comply with international standards, and ensure that it is only judicial bodies, rather than executive agencies or private companies, that determine the legality of content and order its removal. The report appeals to online platforms, such as Facebook, Twitter and Google, to adopt international freedom of expression standards as the authoritative basis for their Terms of Service, drawing upon the framework of the Ruggie Principles on business and human rights. The report underscores that for companies to show their respect for human rights an overhaul when it comes to transparency is required, both in respect of rule-making and rule-enforcement. Notably, the report cites ARTICLE 19’s proposal of independent “social media councils”, modelled on press councils, as “among the best ideas” for compliance mechanisms that respect rights while ensuring that appropriate remedies are available in the case of their violation. In addition to formally responding to the report in the interactive dialogue, ARTICLE 19 will hold a side event, co-sponsored by the delegations of Sweden and Germany, to dig deeper into the report’s findings and recommendations. At the event, we will also launch a new ARTICLE 19 policy on terms and conditions. The discussion will be timely, coinciding with negotiations of an HRC resolution on the promotion, protection and enjoyment of human rights on the Internet, led by Sweden, with Brazil, Nigeria, and the United States. This will be a follow-up in a series of resolutions, the one last adopted in July 2016, which reaffirm that “the same rights people have offline must also be protected online”. The 2016 resolution had called for an OHCHR report on addressing the digital gender divide, which was presented to the HRC in June 2017. The HRC38 resolution provides a crucial opportunity for the HRC to respond to a growing number of attacks on freedom of expression online around the world, to restate basic principles and also provide greater specificity to States in condemning actions that violate international human rights law. 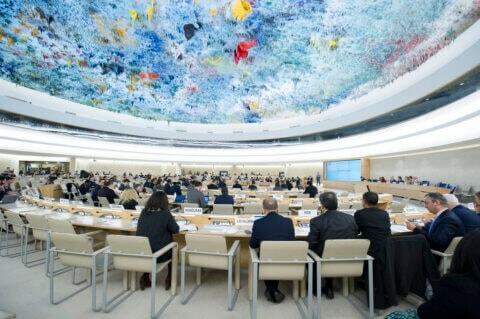 HRC38 marks two years since States “condemned unequivocally” Internet shutdowns and website blockings, though the practice has continued unabated since. Two years ago, we criticised States for failing to adequately address a number of other priority issues, including protections for anonymity and encryption, as well as concerns around governments pressuring private companies to engage in censorship. Ensuring any new resolution addresses these priorities, and draws upon the recommendations of the Special Rapporteur in his various reports, will be essential. The High Commissioner for Human Rights will present an important report to the HRC on the issue of civil society engagement in international and regional inter-governmental organisations. The report, called for in HRC resolution 32/31 (July, 2016), identifies numerous good practices, while also setting out concrete proposals for increasing civil society space in the UN and other international and regional organisations. It underscores how the effective functioning of these organisations is “inexorably linked” to civil society participation, with restrictions on civic space therefore presenting a key obstacle to international and regional organisations achieving their mandate. Reflecting input made by ARTICLE 19, the report acknowledges that the right of access to information underpins civil society participation, and makes clear that the adoption of policies on access to information that conform to international standards should be among the main priorities. The report also backs long-standing calls for the UN Economic and Social Council Committee on NGOs to be reformed, to depoliticise the accreditations process and to cease the practices of some members abusing their position to lock diverse and critical civil society voices out of the UN. A new resolution on “civil society space” at HRC38, led by Ireland, with Chile, Tunisia, Sierra Leone and Japan, provides a key opportunity for States to commit to act on the recommendations contained in the High Commissioner’s report, and drastically improve civil society engagement in inter-governmental organisations. ARTICLE 19, working alongside our Civic Space Initiative partners, will be advocating for the resolution to also address the continuing trend of civil society space shrinking at the national level. We’ll be calling on States to publicly and unequivocally reject threats, harassment and attacks against civil society actors, to condemn the use of permanent “states of emergency” to justify repression, and to lift unnecessary and disproportionate restrictions on the right of access to resources. It is expected that States who engage in these practices, who are among the HRC members, will push back against any new commitments on these issues. The report of the newly appointed Special Rapporteur on the right to freedom of peaceful assembly and association, Clement N. Voule, (A/HRC/38/34), is expected to set out his vision for the mandate, and his priority areas for action. The role of freedom of peaceful assembly and association in implementing the 2030 Agenda for Sustainable Development, as well as how these rights can be safeguarded in the digital age, are expected to be among those priorities. At the same time, Switzerland and Costa Rica are expected to lead a resolution on human rights in the context of peaceful protests, following up to a March 2016 resolution on the same topic. Focusing on the proper management of assemblies, the title of an earlier joint report and set of “ten principles” by special procedures, the resolution is expected to raise concerns at how human rights in protest are increasingly restricted through attacks on the Internet and secure communications, and call for a report on that topic. The report of the Special Rapporteur on violence against women focuses on “online violence” and “violence facilitated by information and communications technology (ICT).” It reflects on how, notwithstanding the particular benefits the Internet and ICTs have brought to women and girls, the challenges of emerging forms of discrimination and violence in digital spaces are substantial. The report makes clear that the forms of harm associated with such discrimination, including gender-based violence, can lead to women and girls withdrawing from the Internet, impacting freedom of expression for all people. As terminology in this area is recognised in the report as still developing, the Special Rapporteur emphasises that it is crucial that any restrictive responses by States to “online violence” in criminal and civil laws comply with international human rights law, in particular the rights to freedom of expression, privacy and principles of data protection. This will require, in particular, that any laws prohibiting forms of online expression be carefully and narrowly defined, and meet the requirements of necessity and proportionality. Following the Special Rapporteur’s recommendation, Canada will lead a resolution on the same issue at HRC38, which we will follow closely. Follow @article19un for live updates and watch online. Use #HRC38 to join the discussion, and check out our UN work as the Session progresses.